I’ve built a lot of applications to demonstrate what SendGrid can do over the past few years. Recently, I’ve started either updating them, getting rid of really old ones, or replacing them with newer ideas and more modernised examples. With the apps I’ve been updating, the biggest change has been removing all of the inline template code for the emails being generated by the app and moving it to SendGrid’s Template Engine, leaving behind a much cleaner looking codebase and a much more manageable set of templates. I built Oh, Cardless to fix the problem of either forgetting or running out of business cards. 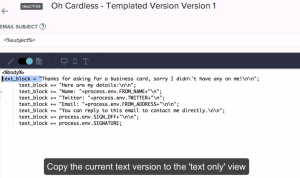 You can read more about what it does and how I built it in the post Oh, Cardless: My Business Card Email App from last year. Massive, isn’t it? Thankfully, there’s a lot that can now be removed from this to clean it up. These are the substitutions required by the template you see being built in the video above. I’ve passed them in one at a time because it looks more readable, but it’s also possible to pass all of them together. That’s it, overall it’s a relatively quick process that gives you much cleaner, manageable emails that you can tweak and play around with without having to redeploy any code to production.